Using just four classic botanicals: juniper, winter savoury, angelica root and coriander, this is a lovingly crafted recreation of Berry Bros. & Rudd’s orignal dry gin – first made in 1909. The gin was originally produced back in 1909 but it disappeared from the merchant’s range in 2014. After a four-year hiatus, it has been re-introduced to the UK. A sample of gin was taken from the merchant’s oldest remaining bottle, dating from the 1950s, and was given to Thames Distillers who then recreated the formula. Berrys’ Best Gin has botanicals including juniper berries, coriander seeds, angelic root and winter savory. It is described as having “hints at violet creams and a soft chalkiness” on the bouquet with a “floral slant” on the palate. 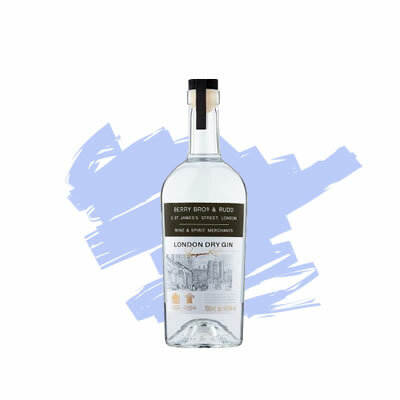 It’s a complex, well balanced gin with a wonderful combination of botanicals and flavours such as the not often seen winter savory, which creates an exceptional Gin – Thames Distillers was delighted to be commissioned by Berry Bros & Rudd to distil a modern-day version of Berrys’ Best Gin. It was a fascinating challenge to build a recipe with just a small sample of the 1950’s gin as a reference. We are very pleased to have made a product which has been passed as being up to Berrys’ renowned high standards and a match to the historic gin. Crystal clear in colour. The bouquet shows piney juniper, peppery spice with faint nutty angelica. The palate is clean, bone dry and classic London dry in style. Piney juniper to the fore with assertive peppery spice. Long spicy finish with lingering coriander, simply clean and very traditional in style with juniper rightly dominating. 1. Stir the ingredients with ice and strain into a chilled Martini glass. 2. Drop a cherry into the glass and finish with a twist of lemon.